The Bulbdial Clock kit is based on an original design concept from IronicSans.com. It works like an indoor sundial, but with three shadows of different length. You tell the time just like you do on a normal clock, by reading the positions of the hour, minute, and second hands. The Bulbdial clock is designed to be mounted in a handsome, laser-cut acrylic case that makes it suitable for desk or mantle use. The included case is Black acrylic for the back and Clear acrylic for the front. The Bulbdial clock kit comes complete with three custom circuit boards, 72 ultrabright LEDs, pre-programmed ATmega168 microcontroller with Arduino bootloader, tactile button switches, aluminum standoffs, 20 ppm quartz crystal, pre-selected clock face, gnomon spike, universal-input plug-in power supply, stainless mounting hardware, plus the resistors, capacitors and other little parts needed to build the Bulbdial clock. Note: The Chronodot module shown in the photo is an optional accessory available separately. The kit comes with 12 red, 30 green, and 30 blue LEDs, marking hours, minutes, and seconds. The colors provide contrast and tend to mix in interesting ways. The Bulbdial clock is designed to be mounted in a handsome, laser-cut acrylic case that makes it suitable for desk or mantle use. This particular kit comes with the Black back/Clear front. Other cases are also available separately. Cases options include Tortoiseshell, Abalone Pearl, Black Granite, Black back/Smoke front. The FTDI USB-TTL converter cable (not included) provides an optional interface between your computer and your Bulbdial clock. It can be used (1) to sync the Bulbdial's time to the time on your PC, (2) to reprogram the Bulbdial clock through the Arduino IDE, or (3) to make the Bulbdial clock into a USB powered Bulbdial clock. 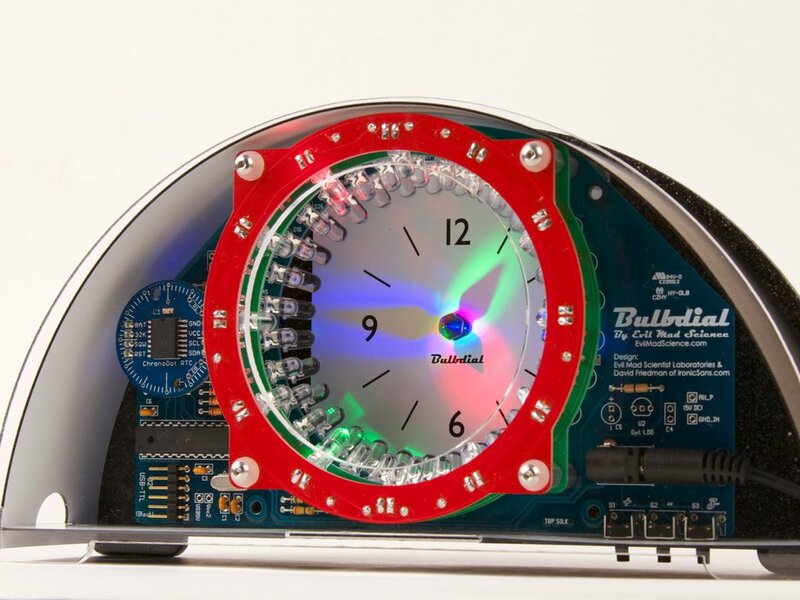 The Bulbdial Clock is sold as a soldering kit. Basic electronic soldering skill is required, and you provide basic soldering tools: a soldering iron + solder and small wire clippers. You will also need internet access to read or download our detailed assembly guide. No additional knowledge of electronics is presumed or required. Easy "through-hole" construction and clear, photo-heavy instructions are provided. Assembly time: 1-3 hours, depending on your level of experience with soldering. The Bulbdial clock kit is open-source in both hardware and software, and is designed to be user friendly and hacker friendly. The on-board microcontroller is an ATmega168, running a program atop the Arduino bootloader. FTDI USB-TTL and AVR-ISP programming header locations are provided on the circuit board. The circuit board also features alternate mounting hole locations-- in case you're building a different case, and a location for a 5 V regulator. We included a few extras of most small, easy to lose and/or break components. Assembly of the boards is pretty straightforward if you like to solder; it basically requires stuffing the components in the boards and soldering (a lot of) easy through-hole components. You should have prior experience soldering and basic soldering tools. Watch the video below to see the clock in action.